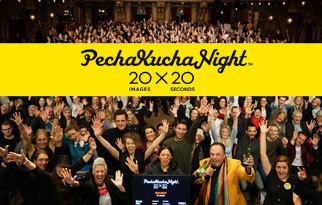 PechaKucha 20×20 is a simple presentation format where you show 20 images, each for 20 seconds. The images advance automatically and you talk along to the images. PechaKucha Nights are informal and fun gatherings where creative people get together and share their ideas, works, thoughts, holiday snaps – just about anything, really –in the PechaKucha 20×20 format. Svensk Form is an ambassador for PechaKucha in Sweden. PechaKucha was created by the architect couple Klein-Dytham in Tokyo in 2003. Initially the idea was to create a place for young designers to meet, network and highlight their creations to the public. It evolved over time into a patented system to avoid drawn-out speeches who never comes to an end.